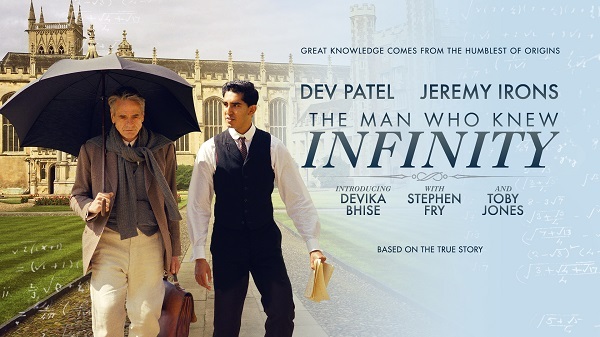 “The Man Who Knew Infinity” (2015) is a film about the clash between Augustinian view of mathematics and its secularized, atheistic corruption that ruled Trinity College, Cambridge, before and during WW1. The conflict becomes interesting because Augustin’s Christian view is articulated by a goddess worshipping, Hindu Mathematical genius, Srinivasa Ramanujan (1887 – 1920), wonderfully played by Dev Patel. Secularized atheist mathematics is presented by Ramanujan’s maverick mentor, G. H. Hardy (1877 – 1947), performed by Jeremy Irons. The actors breathe life into an abstract and potentially boring subject. Present throughout the movie, as Hardy’s friend and colleague, is Britain’s celebrated atheist, Bertrand Russell. He “completed” the secularization of Europe’s Christian mathematics, begun by Descartes. Film’s director, Matthew Brown, wrote the screenplay based on Robert Kanigel’s Book: The Man Who Knew Infinity: A Life of the Genius Ramanujan (Washington Square Press,1991). Hardy is remembered for his 1940 essay on the aesthetics of mathematics in, A Mathematician’s Apology. Yet, the film opens with Russell’s quote, ”Mathematics, rightly viewed, possesses not only truth but supreme beauty…” Ironically, one of the film’s subtle points is that true truth and beauty are philosophical ideas that make no sense in a God-less universe. Ramanujan had no college degrees and hardly any formal training in Mathematics. He landed up in Isaac Newton’s college on the strength of the mathematics he had done in his note books. On his own, he had solved problems that were puzzling Cambridge professors. He had re-invented formulas that no body told him already existed. The clash of world-views came because Ramanujan “saw” or “received” complex mathematical formulas “intuitively,” just as entire symphonies came to Mozart. Hardy’s Cambridge, wedded to logic, could not deny the reality of “intuition.” Yet, for their atheism all “truth” had to be a social construct, invented by humans. Nothing could be called “true,” unless it was derived from logic and proven logically. Cambridge’s atheistic philosophy of mathematics could not comprehend Ramanujan. Hardy is forced to ask him, “How does all this [math] come to you? The possibility of divine revelation is completely unacceptable to Cambridge atheists. Therefore, in the film, Ramanujan asks Hardy, “Do you believe me? You would believe me if you are my real friend.” (For I don’t confide such intimate, private truths to non-friends). Those who really want to understand the clash of world-views depicted in “The Man who Knew Infinity” should read the works of James Bradley of the Dept. of Mathematics and Statistics in Calvin College, USA. His papers are on the internet. Bradley explains how St. Augustine’s theology nurtured European Mathematics for 1500 years; how Europe secularized it between 1850-1950; the intellectual problems that secularization created; why these problems brought Enlightenment’s modernism to an end; and how the Bible’s worldview can yet help postmodern academy recover sanity. Ramanujan’s math continues to be useful, including in helping scientists make some sense of how black holes might work. However, Ramanujan’s historic significance lies in the fact that he exposed atheism as incapable of making sense of numbers in cosmos and their correlation with mathematics in the human mind. He forced secularists to go beyond logic to consider inspiration, intuition, and direct revelation from supernatural realms.